Front Range Clinic is fortunate enough to be located in the stunningly gorgeous state of Colorado, home to endless natural beauty and a variety of landscapes. A lot of people don’t seem to know it, but Colorado is actually an arid high-desert climate with plenty of dunes and desert land in the southern parts of the state. Combined with the epic expanse of the incredible Rocky Mountains, there’s just no way that you can beat spending a day appreciating all of the jaw-dropping sights that this state has to offer. Our drug rehabilitation services in Fort Collins, Longmont, Greeley and beyond encourage a good deal of reflection with our patients, and Front Range Clinic believes that spending time outdoors in nature is one of the best places to sort through some of the thoughts and feelings that accompany the rehabilitation experience. At Front Range Clinic, we provide our patients with a safe, friendly and non-judgemental environment where our patients around the very things in their life that brought them here in the first place. Looking ahead from the past, we’re solely concerned with your present and future and helping build you up with positivity and encouragement to a healthier life. Absorb the quiet rustling of the wind and the leaves or stare out onto the pristine reflection of one of the many lakes up in Rocky Mountain National Park and you’ll quickly realize how calming it is out on the trail. Being up in nature offers much more of a “present” type of experience, where you’re limited with all the distractions you can find back in town. With no internet to use your devices on, no restaurants or shopping nearby, and no cars to provide any noise pollution (and real pollution), the mystifying effects of nature begin to unfold on their own. 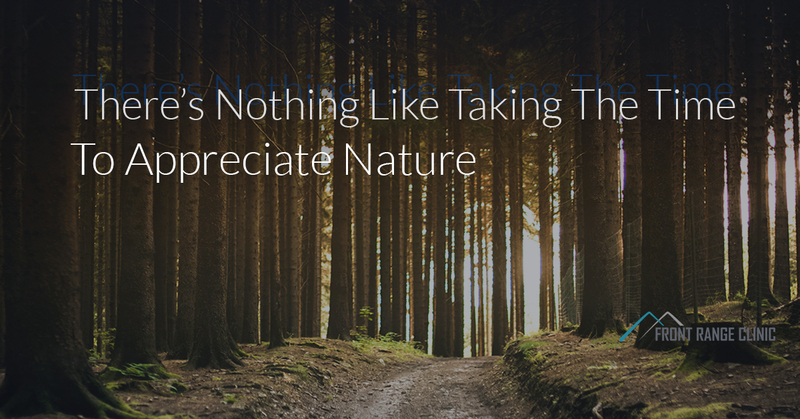 It’s no wonder that nature therapy is an entirely legitimate phenomenon. Walking is good for our minds and our bodies. Not only is walking good physical exercise, but it also stimulates the mind and helps it work through certain thoughts and words. If you’ve ever been on a phone call and walked around during the call to think more clearly, then you’ve experienced what we’re talking about. The path to addiction recovery is not an easy one, but it is a rewarding one that we can help you navigate. To take the next step to get help with drug addiction, please contact Front Range Clinic today to get started.